You will be picked up at your hotel by an executive shuttle bus and whisked out to the trail head while getting to know your local guide and learn about the surrounding area. 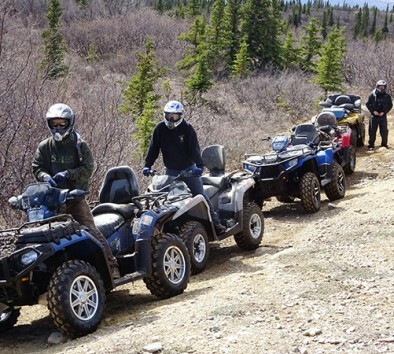 At the trail head, your guides will have a safety briefing on the operation of the ATV’s and safety on the trail. You will be required to do a practice drive before proceeding to the trail. Next, travel on a winding trail through a boreal forest to a scenic lookout. You will have many opportunities to stop for pictures—so just ask your friendly guides! All the ATV’s are designed to safely transport two (2) riders so this is a great activity for couples or friends. You will be driving off-road in Alaska for 24-miles but don’t worry, all the ATV’s are equipped with power steering and automatic transmissions to make the miles easily go by. Return to the bus for a relaxing trip back to the hotel and enjoy complimentary snacks and water from the comfort of your seat! Minimum age is 10. Maximum weight is 300 lbs. Minimum age to drive is 16 years. Bring your driver’s license. Pregnant women or guests with back or neck problems are not allowed to participate. Ride will be bumpy. Tour will operate rain or shine. All riding gear is provided. Wear closed-toe shoes. Bring a rain jacket and a camera. Single driver not permitted. Each ATV requires double occupancy. Each guest on the tour must purchase individually and if traveling alone, you will be paired up for the adventure. Wildlife sightings are likely but not guaranteed.